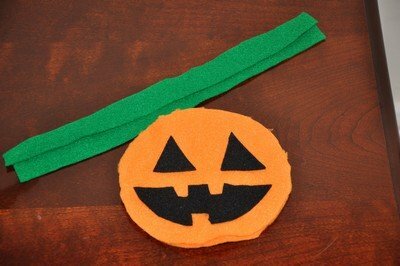 Need: Orange felt, Green felt, black felt. Scissors. Fabric Glue or Sewing Machine threaded to sew or hand sewing needle and thread. Cut orange felt into a round pumpkin shape. Cut Black felt into eyes, nose, and mouth shapes for pumpkin tote face--use your imagination for this or use regular "pumpkin shapes". Glue black shapes to pumpkin front. Cut out pumpkin back to match front. Use fabric glue to put together or sew by hand or machine leaving an opening at the top. The green felt is used for making handles to carry tote. Cut handles 12 inches long x 2 inches wide. Glue in place at top or hand sew in place. (Make sure it is comfortable fit--can place where it is easiest to handle--near seam edges at top). Make a "Ghost" tote by using white felt and black felt for eyes. Follow directions above. For handles--can use white or black same length. Yes, please send us a photo if you can sometime. 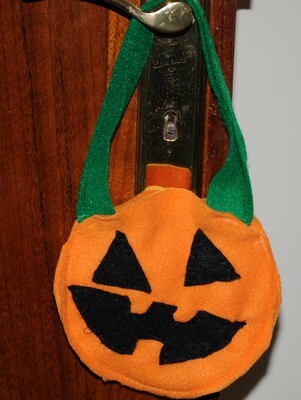 I think this is a cute Halloween fun project to try for kids. Thanks for the contribution. This sounds like a fun sewing project for Halloween and would work good for trick or treating.